Contrailsthose cloudy tracks laid across the sky by jet planeshave a noteworthy effect on the local climate below, new research shows. A study recently published in the International Journal of Climatology suggests that in places where jets and their contrails are common, meteorologists could routinely add their effects to weather forecasts. Contrails form wherever jets fly through the right atmospheric conditions. Water vapor in a jet's exhaust condenses into water droplets or ice crystals, aided by microscopic seed particles from smoke, dust or pollen. The result is an instant cloud tracing the jet's route through the air. A contrail may evaporate quickly or persist for hours, depending on temperature and humidity conditions. Winds may smear it out. If enough contrails are present, they may combine into a thin carpet of high cloud. Contrails are more than just a pretty sky feature or aerial annoyance. Scientists saw a dramatic example of their importance in September 2001, when the U.S. government grounded commercial airlines for three days in the wake of the 9-11 terrorist attack. During that time, areas that were prone to contrails, like the Midwest, had significantly warmer days and cooler nights. The study's authors, Jase Bernhardt and Andrew Carleton, are two atmospheric researchers at Penn State University who made a more systematic effort to study the effects of contrails on daily temperatures. They learned that contrail "outbreaks" have definite effects on ground temperatures, and those effects may be predictable. The researchers looked for contrails in satellite images, examining regions of the U.S. where contrails are common. To avoid the effects of snow and other influences, they picked the South in January 2008 and 2009, and the Midwest in April 2008 and 2009. They found satellite images from clear days in which multiple contrails appeared, selecting outbreaks that lasted more than four hours. For each outbreak, they looked at the records from a weather station beneath the contrails and another station less than 100 miles away without contrails. 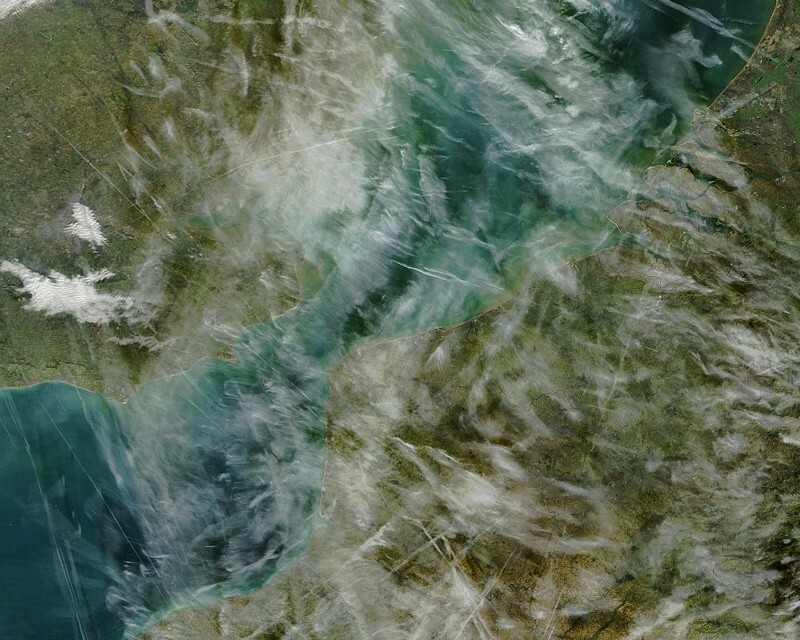 For instance, they paired weather records on April 2, 2009 from Erie, Pennsylvania (contrails) and Buffalo, New York (no contrails). The results were clear. 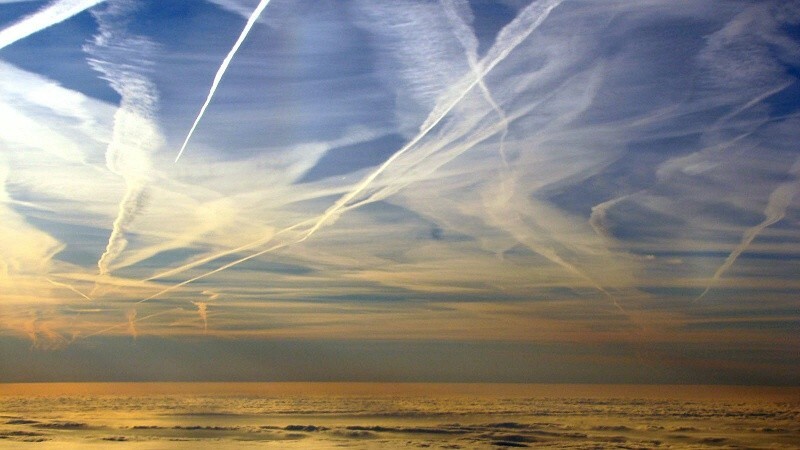 By warming the nights and cooling the days, contrails reduced the daily temperature range, on average, by 6.4 degrees Fahrenheit in the South in January, and 5.3 degrees in the Midwest in April. Individual cases varied, though, from no effect to as much as 27 degrees. The effect on daytime highs was greater than the effect on nighttime lows. To make sure of their findings, Bernhardt and Carleton also compared the same pairs of weather stations on the day before and the day after the contrail outbreaks, and found the temperature effect disappeared without the presence of contrails. Professor Carleton explains the research in this video from Penn State University. In causing warmer nights and cooler days, contrails act like ordinary clouds. We see the same effect in the Bay Area whenever a blanket of "marine layer" clouds covers the countryside. If these results hold up in further studies and in other regions, they may lead to more accurate predictions of daytime highs and nighttime lows in areas of high jet traffic. High-precision weather servicesor "nowcasters"can make use of this new advance with their customers. Fruit growers, for instance, keep close track of the expected nighttime "chilling hours" their orchards require during winter dormancy. Electricity providers need precise forecasts when high daytime temperatures could threaten to overload the power supply. As the globe continues to warm, our ability to model the new climates in every locality will grow with each scrap of atmospheric knowledge we can win from nature. Even small changes in the daily temperature range can ripple through the master equations of climate models. As air travel increases in coming decades, this new finding can help us better predict and manage the side effects of this crucial tool of civilization.